To begin, such talks are not a “reset.” Israelis and Palestinians have been talking to each other ever since the fabled Oslo process of 1993. They are negotiating face to face as you read this about all kinds of practical matters: roadblocks, investments, tax receipts. Hence, the very idea of proximity talks is a step backward, though an amusing one. Mideast envoy George Mitchell carrying a yellow pad back and forth between folks who already have a working relationship? And who are in constant contact about nabbing terrorists and training Palestinian security forces? Next question: will the scribbling be in Hebrew, Arabic, or English? This called for some bare-knuckles bargaining before the conversation actually began. Nonetheless, Prime Minister Benjamin Netanyahu of Israel cheered the announcement posthaste. The Arab League gave its “permission” to the Palestinians. Both sides liked it because it was a charade. Vice President Biden joined the show with a five-day trip to the region—all in the name of “restarting the peace process”—before an awkward announcement of East Jerusalem construction forced that process to a sudden halt. So why the Mitchell two-step? The official PA answer is: no settlement freeze, no direct negotiation. But the real explanation for the room-to-room shuttling is a lot more complicated. Economists have a fancy term for it: Pareto optimality. This is a position in the bargaining process where neither side can do better by moving away from it. In this case, both sides would do a lot worse. Think about the dreams and ambitions they would have to put on the table to eke out a deal that has eluded them for decades. The Israelis would have to yield half of Jerusalem, the “forever undivided capital of Israel.” They would have to let go of settlements in the “Land of Israel.” Evacuation was hard enough when it entailed the forcible removal of a few thousand settlers from Gaza, but the West Bank is the real thing, a quarter million people whose relocation comes with the specter of civil war. Proximity talks aren’t much of a “reset,” anyway. 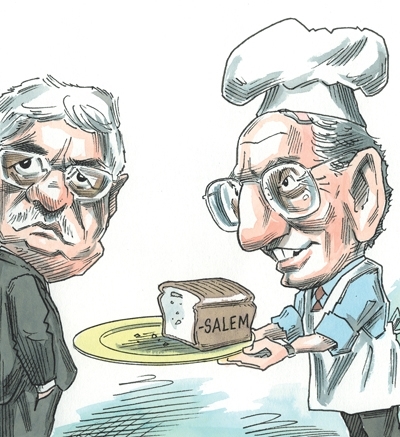 Israelis and Palestinians have been talking to each other ever since the fabled Oslo process of 1993. The Palestinians would have to part with the “right of return,” which the Israelis correctly see as conquest by other, demographic, means. They would have to take half of the loaf they believe is all theirs. The prize would be not a sovereign state but a kind of Israeli protectorate—complete with Israeli outposts and severe limits on military capabilities. Surely, Israel will not “pull a Gaza” again, leaving behind a Hamastan as a missile launch pad. Worst of all, whoever signs such a deal might end up on a death list as traitor to Islam and the Arab world. Recall what happened to Jordan’s King Abdullah in 1951 and Anwar Sadat of Egypt in 1981. Hence the Mitchell minuet, a remake of the Baroque dance in which everybody circles, bows, and returns to the original position. Netanyahu is happy to have a format that will bog down in minutiae. Abbas is happy to have talks that are no talks. Each side will actually negotiate with the American go-between and his masters in Washington, trying to squeeze out leverage against the other. It’s been done before, in Camp David 2000, and Bill Clinton was a lot bigger than Mitchell can ever be. No matter what, Israel will not “pull a Gaza” again, leaving behind a Hamastan as a missile launch pad. This may well be the second major strategic blunder of the Obama administration. The first was the vaunted Cairo speech last year, when the president reached out to the Islamic world while leaning hard on Israel. The predictable result was that the Arabs asked for more while the Israelis dug in—better right away than wait for push coming to shove. Now the United States is once more plunking down its prestige in a high-risk, low-gain gamble. Again, Obama has ignored an iron law of Mideast politicking: when the United States orchestrates, Israelis and Palestinians don’t fiddle as a duo but try to sic the conductor on each other. Such was the prelude. It was followed by worse: the most noxious crisis in U.S.-Israeli relations since the Eisenhower administration ordered the Israelis out of Sinai after they had routed Egyptian forces in 1956. Pressure on ornery allies sometimes makes sense. In the Obama case, though, it is compounded by a diplomatic no-no: vindictiveness and humiliation. 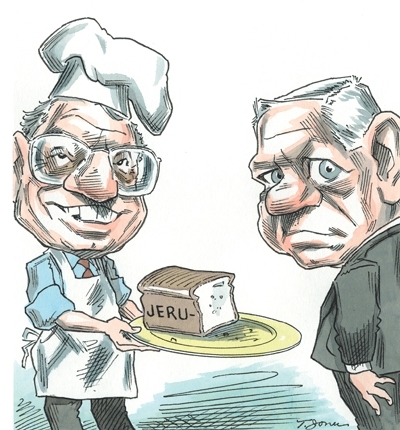 To go off to dinner while leaving a visiting prime minister behind (and presumably encouraging him to send out for pizza), as Obama did to Netanyahu in March, was not just an insult. It was an irrational, deeply personal move unbecoming to the president of the one and only superpower. But the sequel was worse yet, betraying a tragic misunderstanding of the Middle East. The president made that misreading explicit when, in so many words, he blamed Israel for America’s troubles in the region: “When conflicts break out . . . we get pulled into them. And that ends up costing us significantly in terms of both blood and treasure.” The record does not show a single American soldier who has died for Israel. But plenty of them have died in Lebanon, Iraq and Afghanistan—for reasons unrelated to the Israeli-Palestinian conflict. This take, to borrow from Talleyrand, is worse than offensive; it is a mistake. For it confuses a side act on the Middle East stage with the entire drama that is fed by the myriad conflicts that would torment the region with or without the peace process, even with or without Israel. Arab states have fought one another and Iran; their regimes have oppressed their populations, Shia and Sunni have decimated each other, Iraq and Iran have sought nuclear weapons as far back as the shah (who had an informal alliance with Israel). Compared to these hegemonial and ideological conflicts, the Israeli-Palestinian one is patty-cakes—indeed, irrelevant. Today, the real game in the Middle East pits the United States against Iran, as it did in the past against Egypt, Syria, and Iraq, and farther afield against Libya and the Soviet Union. But to confuse a hiccup with cancer is to dispense bad medicine. The (misplaced) hope is that Doctor Mitchell’s talking cure will provide a cover for the Sunni powers and recruit them into an American-led coalition against Tehran. Too bad Syria keeps strengthening its alliance with Iran (and its surrogate, Hezbollah), and that Riyadh will never hop off its favorite resting place, the fence. These proximity talks, though a nice ritual, will not change the larger strategic calculus of the Arab world. Netanyahu is happy to have a format that will bog down in minutiae. Abbas is happy to have talks that are no talks. Indeed, Obama’s campaign against America’s Israeli ally will badly worsen America’s odds. Israel, severely shaken, will fall back on an equally pernicious strategy, known as ein brera, or “no choice.” Suspecting that it cannot count on Obama’s America, Israel will harden its stance, as in the Janice Joplin song: “Freedom’s just another word for nothin’ left to lose.” The Arabs will harden in a different way—by demanding more concessions. And Tehran will be overjoyed, seeing that Washington is weakening its most powerful enemy. All of America’s Arab friends will recalculate their Iran policy along this logic: if the United States abandons its trustiest ally, how could we rely on Obama when taking risks against Iran? A final word to the wise: Israel and the PA are actually getting along quite nicely now that Yasser Arafat is dead and Fatah’s mortal enemy is ruling Gaza—no broker required. If you want to know what the future could look like, go back to the Herzliya Conference in February. Enter Salam Fayyad, the Palestinian prime minister, in his impeccable double-breasted suit, delivering in his perfect English a speech Israelis had never before heard from a Palestinian leader. Essentially he told them: “We can do business with each other.” The audience wasn’t exactly dewy eyed. But it gave him a standing ovation—face to face. An earlier version of this essay appeared in the Wall Street Journal on March 11, 2010. Reprinted with permission. ©2010 Dow Jones & Company. All rights reserved. New from the Hoover Press is Islamism and the Future of the Christians of the Middle East, by Habib C. Malik. To order, call 800.935.2882 or visit www.hooverpress. org.